I don’t imagine them. They’re quite real. They’re my friends. Things don’t look good from the off for this Beatrix Potter biopic, which comes hot on the trail of another dramatisation of the life of a children’s author (Finding Neverland). Renée Zellweger has already proved adept at an English accent in Bridget Jones, so at least that isn’t issue. But her take on Potter is extremely mannered, and initially highly off-putting (we’re going to be subject to 90 minutes of this?!). No doubt this is exacerbated by my generally finding Zellwegwer an alarming screen presence (the perma-squint being just one of her quirks). These performance choices may have lent accuracy to her rendition of an author with a highly active interior life and a less accomplished social one, but the actress does little to make herself endearing. Which, surely, is the aim of the filmmakers (in contrast, Emily Watson, playing Beatrix’s spinster friend Millie, captures exactly the likeable-but-eccentric tone that Zellweger needed). That said, Renée isn’t a deal breaker. She is unable to put the kibosh on enjoyment of this very slight tale, which ambles along agreeably but undramatically before being anchored by a touch of tragedy. Potter’s passion for her art and a world of her own creation is announced by the filmmakers in the most unsubtle of ways (she talks to her creations, Peter Rabbit, Jemimah Puddleduck et al; and they, in animated form, respond). It’s the sort of choice that has the veneer of Hollywood at its most twee (“a truly magical world!”) and prescribes the kind of “whacky sensibility” whereby true creatives experience full-blown hallucinations, such are their limitless imaginations (in Los Angeles I’m sure they do, albeit chemically-induced). The other aspect of this that slightly irks (I didn’t out-and-out hate this element, but I felt like an unnecessary attempt to load the deck) is the animation itself; in making Potter’s images more cartoonish, the beauty and texture of the original watercolours is lost. None of the conflicts established for Potter to overcome (an overbearing mother who dismisses her passion, her remaining unmarried and being outspoken with her views during a period where women’s roles were straightjacketed) are too daunting, one of the reasons the final film is such a gentle affair. If her mother’s (Barbara Flynn) a bit of a ‘mare, dad (Bill Patterson) is essentially an agreeable sort. Ewan McGregor is cast to his strengths as Norman Warne, the guileless publisher who takes a personal interest in Potter (Watson plays his sister). But, without the loss that befalls her, the film would float off into immateriality; we are treated to repetitive scenes of a disapproving parent, or of Ewan gazing adoringly at each new piece of artwork Potter shows him. There is only so much story to tell, it seems. And, when the dramatic meat arrives, attempts to reflect tragedy through her paintings are particularly unsubtle. Much better are the scenes in her adopted Lake District home(s) as she rediscovers her affinity for the area (a childhood holiday home) and takes an interest in the preservation of the way of life there. As with any fictionalised telling of the life of a historical figure, there is a fair amount of omission and addition; it would have been nice to have some insight into her illustrations of the natural world, and the accompanying interest shown by the scientific establishment. And her brother Bertram is only seen during childhood flashbacks, although referred to by the adult Beatrix. What befell him? This was director Chris Noonan’s first film in 11 years (following Babe), and it looks as if the same time may pass before we see anything further. 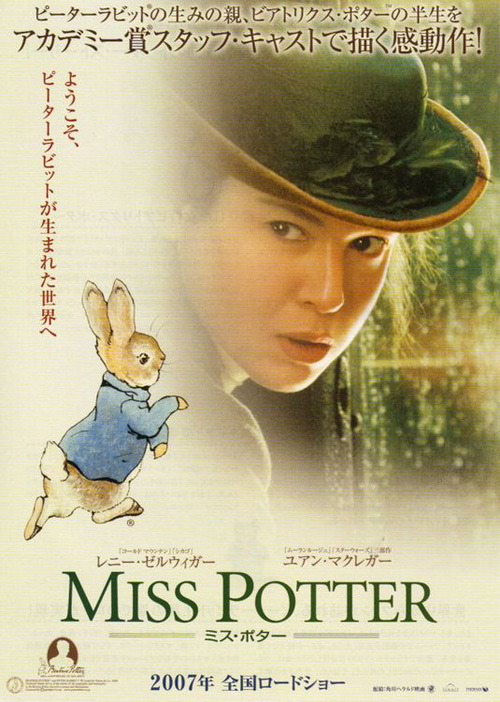 There’s a generous spirit to both of these confections, but Miss Potter lacks Babe’s innocent charm. Which, ironically, makes it a far better companion to the author’s books than the film about her life.